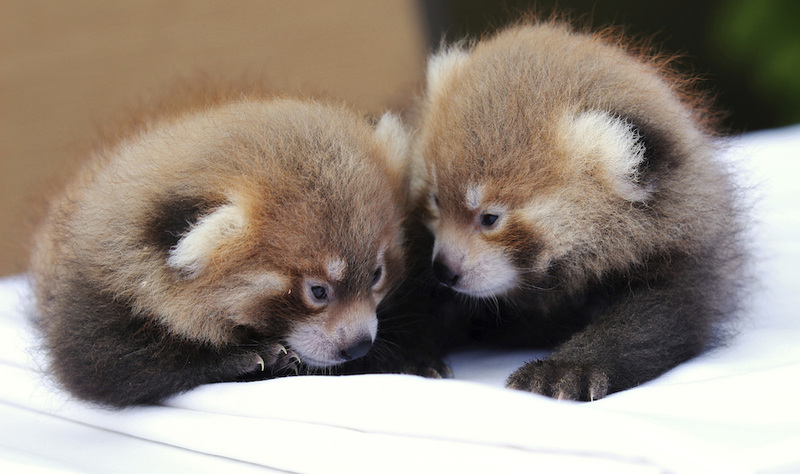 SYRACUSE, N.Y. (CN) – Belonging to an endangered species with fewer than 10,000 left in the wild, newborn red panda twins Loofah and Doofah made their debut Tuesday at an upstate New York zoo. Named after characters from the children’s movie series “The Land Before Time,” the males cubs were born on June 21 at the Rosamond Gifford Zoo in Syracuse to mother Tabei and father Ketu. Onondaga County Executive Joanne Mahoney introduced the cubs to children who attend summer camp at the zoo Tuesday morning. Accredited by the Association of Zoos & Aquariums, the Rosamond Gifford Zoo is working to increase the red panda population. Zoo officials say the cubs are being bottle fed as Tabei has had trouble caring for them. Tabei’s previous cubs, Ravi and Amaya, were born in 2016 and are now at zoos in Detroit and Sacramento. Native to Asia, red pandas have bear-like bodies and grow to slightly larger than domesticated cats. More than half the breed’s original population has died off over the past three generations due to deforestation, poaching and the illegal pet trade. Fewer than 10,000 of the tree-dwelling herbivores remain in their natural habitat in the forests surrounding the Himalayan Mountains. Roughly 700 red pandas are thought to live in zoos, though the exact number is unknown. In 2015 they were placed on the endangered species list. They were previously labeled endangered in 1996, after being on the “vulnerable” list.